A few years ago my life was turned upside down. I entered into a deep depression. Though I don't want to get into what got me there, I do want to say I was stuck. It had gotten so bad that I stopped sleeping. And if anyone has ever lacked sleep you will understand when I tell you being sleep deprived brought out my crazy. But each night I would lay awake and just worry and drive myself crazy with "what ifs" and thoughts like "you aren't good enough, your life is going no where." Satan started to lead me down a very dark path. It was around July 17th of that year that I decided no more and I took a hold of my life. The worse part is I was all smiles on the outside! If someone would ask me 'how are you?' my instant response was "GREAT!! I am doing GREAT!" And with each fake smile and each false GREAT that I proclaimed a small part of me shriveled up. I was determined that no one saw the weakness I had. Determined to fake fine. Determined to hide the truth, to hide the real. I know this all happened around July 17th because my parents were away for my moms birthday. And the 17th happens to be her birthday. They were away the day I really did decide I couldn't do life like this anymore. The worse day of my life, and strangely enough also the best. It was the day I hit rock bottom and my depression/Satan almost won. But it was also the day God reminded me just how strong I was. The day God reminded me that it is okay to be weak and that in my weakness he will shine. I called my dad at 5am (during his vacation!) and at that point I was up for almost 48hours. For the first time in a long time I got real. I told my dad I wasn't okay and it was one of the hardest things I ever had to do. Most people think pretending to be okay and faking fine makes them strong. Admitting a weakness and exposing yourself takes more courage and truthfully without God I couldn't have done it. From that day on I was determined to never fake fine again. I still have not perfected the art of being real, but each day I get a bit closer. And by letting go and letting God the journey of life isn't so bad anymore! The reason I am sharing this with all of you is because maybe you are in a similar situation. Maybe you to are hurting on the inside, but smiling on the outside. Maybe you like me have spent so long faking fine that you don't even know how to get back to real. I don't have all the answers and truthfully I am not that great of a motivational speaker. But I can tell you giving it up to God is step one. Because nothing you do in life with be successful without him at the helm. Natasha Bure's new book Let's be Real! 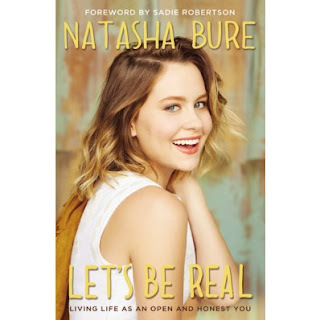 With her spunky, artful, and unashamed attitude, Natasha Bure pushes back and gets real. Whether it’s acne, boyfriends, faith, stress, or having fun with girlfriends, Natasha shares her views on personal experiences, and shares insightful ways she’s approached road-blocks. To be put simply, no matter what you face, always be honest and real. I love that this book deals with everyday situations where we tend to lie to ourselves and fake fine.